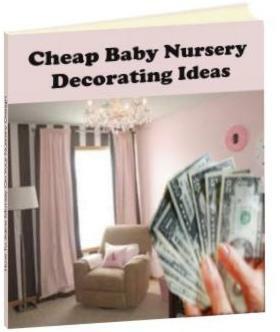 A Selection of Baby Nursery Decorating eBooks. Available For Instant Download - No Waiting For Delivery - No Shipping Costs! Get Cost-Effective Nursery Decorating Ideas and Tips To Kickstart Your Nursery Design Project Today! If you are looking for cool nursery decorating ideas, browse our unique selection of helpful baby room decorating eBooks. They're available for immediate download, which means you can start your nursery decorating project right away! With over 100 nursery pictures! Choosing the perfect nursery design for your precious bundle can seem like an overwhelming task! If you're not sure where to start with your baby nursery decorating project then this e-book is for you! Don't feel that you are alone. Many moms-to-be want to do something really special with their little one's room or space but it's hard to get started. Maybe you're just feeling tired and overwhelmed. That's pretty normal considering the amazing changes your body is going through right now! Maybe, like most moms, you've seen the plethora of nursery ideas out there and your head is spinning - you just don't know where to start. Nursery Design Step by Step will take you through all the decisions you need to make in order to arrive at the best baby room design for you. After following my simple step-by-step approach to designing your nursery, you'll know exactly what you want to do and you'll be looking for the nearest paint brush! 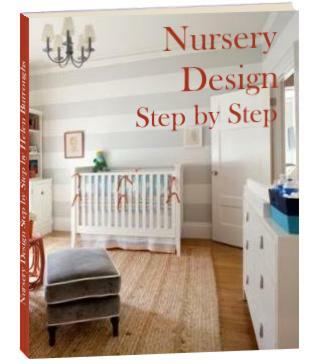 Start Your Nursery Design Today! And get How To Protect Your Baby in the Nursery and Cheap Baby Nursery Decorating Ideas FREE! In Cheap Baby Nursery Decorating Ideas I'll share with you over 60 money saving ideas accumulated during my 10 years of nursery decorating experience. There are lots of ways to make your baby nursery absolutely gorgeous without spending a bundle. Finally, a checklist that covers ALL aspects of infant safety in the nursery! Your baby will spend around 70% or more of his or her time in the nursery during the first year. And, because the nursery is the only room in the house where your baby will be left unattended, it requires special attention when it comes to baby proofing. A little thought and planning now will ensure that your baby is secure in the safety of the nursery room when your hands can't be there. How To Protect Your Baby In The Nursery is a comprehensive nursery safety checklist that will help you to achieve safety in your baby nursery quickly and easily. Get your baby nursery safe for your little one today!